Hello all! It is time for something new. You may have noticed that I tend to like baking, eating, fried food and cheese. (Mmm... cheese). And whilst the food on this blog is by no means a balanced representation of my family's daily eating habits, I've decided that it wouldn't be a bad idea for us to include a few more healthy meals in our regular repertoire. You see, my brother works at a Malaysian restaurant, and seems to live on a diet of fried noodles. My dad loves chocolate. At my mother's most recent check-up, she found out that her blood glucose levels and cholesterol were a bit high. And I... well, you've read the blog. Here are some of the simple guidelines the doctor gave us for healthy eating, which should help manage weight, blood sugar and cholesterol. Basically, you have to eat high fibre, reduce sugar intake and eat good fats (oily fish, olive oil, other unsaturated fats). This type of eating plan is, luckily, also beneficial for people without any pressing health concerns. Obviously, my preferred recipe source (Nigella), is pretty lacking in this type of food. So, I've spent the last couple of months picking up magazines I ordinarily wouldn't even have looked at - Super Food Ideas, Diabetic Living, Table, Health and Fitness - basically any magazine containing low-fat, low GI recipes and some health tips. As a bonus, they're all easy recipes with rather cheap and readily-available ingredients. I've left them in strategic places around the house, hoping that my mum will read them and get some cooking ideas too. No luck so far, but I have faith. I have since tried a few recipes from these various magazines - some good, some passable, some downright munting - and will share them with you now. 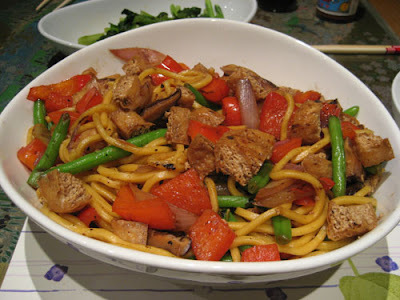 The first photo was from the Women's Weekly Wellbeing Diabetes Cookbook, a tofu stir-fry. No, it wasn't as gross as it sounds. But, it wasn't great either. On the upside, it was quite easy to put together. Just a matter of chopping up some basic vegies and stir-frying them together with various asian sauces, tofu squares and egg noodles. Next up, we have penne with salmon and broccoli, from the September 2007 issue of Super Food Ideas. It consists of boiled penne, mixed with a tin of salmon, cooked broccoli and a cheese sauce. The cheese sauce is made of flour, skim milk, light cream and lite cheddar cheese. The recipe also says to use low-fat spread, but you know I used butter because I think low-fat margarine is evil and wrong. Anyway, it's only 1 tbsp of butter between 4 people; not a huge amount. So, you mix up all the different ingredients, and place them in a dish, sprinkle them with multigrain breadcrumbs and bake. Easy! It actually tasted really good. My family didn't realise it was low fat - score! It was also an easy way to include oily fish (remember - good fats!) in our diets. I thought it was a little insubstantial though; next time I will use wholemeal pasta. ... but the finished product, sprinkled with a touch of parmesan and baked until golden brown, is very yummy. I've found this blueprint for making low-fat, high-fibre pasta bakes to be a very useful one, and think it could be adapted for a variety of ingredients and tastes. On an aside, if a low fat pasta bake recipe asks you to add a can of cream of mushroom soup - DON'T DO IT! I tried it, and it was soooo feral. The final recipe is, again, from the Women's Weekly Diabetic cookbook - dhal with egg and eggplant. It takes an hour to cook, but for most of that time the dhal is simmering away by itself. The dhal is served with a boiled egg per person, steamed basmati rice and some cucumber raita (low fat yogurt, cucumbers and cumin). I quite liked the dish; it tasted like regular dhal and didn't feel low-fat. It is also very high in fibre, which is always a good thing! Good luck Sarah and family! Always a good idea to at least try to eat more healthily, I always fail miserably!